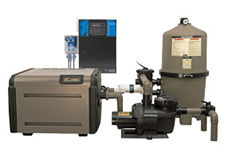 The Aqua Group exclusively uses Hayward Pool Products for all of its equipment, from pumps, to filters, to heaters and much more. Hayward offers superior quality with a 1-3 year warranty on all of its equipment. Please consult your salesman about the warranty and what options are available for your pool or spa. Visit the Hayward Pool Equipment web site to learn more about their products.